According to the Illinois Department of Natural Resources, the frontline on Asian carp is still far downstream of the Chicago River and Lake Michigan but it doesn't mean that we are not concerned that they might continue to work their way upstream. As a result Friends and a host of partners and stakeholders are urging the federal government to support action. Most recently in the form of public comments that will support efforts by the U.S. Army Corps of Engineers to move ahead with project to deter carp at the Branden Road Lock and Dam. Asian carp are one of dozens of types of aquatic species that threaten the Chicago River system, the Great Lakes, and other bodies of water. Defined as Aquatic Nuisance Species (ANS), and ANS is any living organism that is not native to the particular water ecosystem it inhabits. In the water environment, this includes organisms as small as protozoa, viruses, algae as well as plants, mollusks, and fish. 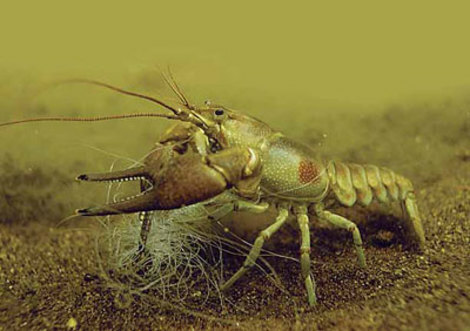 ?The rusty crayfish is invasive to the Chicago River. The ballast water of oceanic container ships carries organisms of all kinds across vast distances and into the interconnected Great Lakes system through the St. Lawrence Seaway. Recreational boats transfer algae and mollusks between local lakes and across the country if they are not cleaned properly every time they are pulled out of a body of water. Even bait buckets and birds can carry undesirable organisms and fish from one body of water to the next. ANS negatively impact the Chicago River system by outcompeting native species for resources, food, sunlight, and oxygen. Protecting against ANS ensures a healthier habitat for the fish, plants, and animals that make their home in and along the river. A diverse ecosystem benefits people too. A river overrun by harmful invasive fish, algae, and mollusks can negatively impact native species populations, reduce aesthetic appeal for recreation, clog boat motors (in the case of the zebra mussels and algae), and cause fish kills resulting in hundreds of floating dead fish. Fortunately, the Chicago River is healthier today than it has been in over a century. To address the ANS issue, Friends’ staff serves on multiple committees and coalitions that actively seek to ensure that the river is protected from potential invaders. Friends advocates for a solution for ANS that protects and improves the Chicago River and its existing uses while preventing ANS from entering our river system. 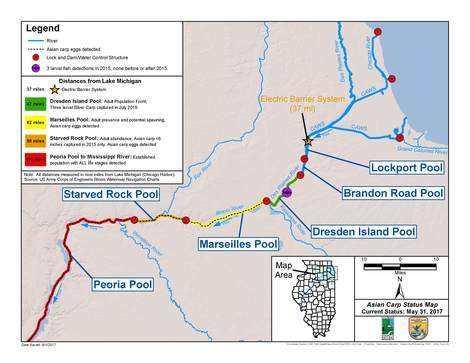 For more information, read about the release of the U.S. Army Corps of Engineers' Great Lakes and Mississippi River Interbasin Study.